A Dutch Racing Driver currently driving for Mercedes Customer Racing in IMSA and ADAC GT Masters. I have always used the same base design and elements for my helmet. I picked the bright yellow color because I like the color and it is easy recognisable for the crowds and viewers. On top there is a lobster because that’s my Zodiac sign. 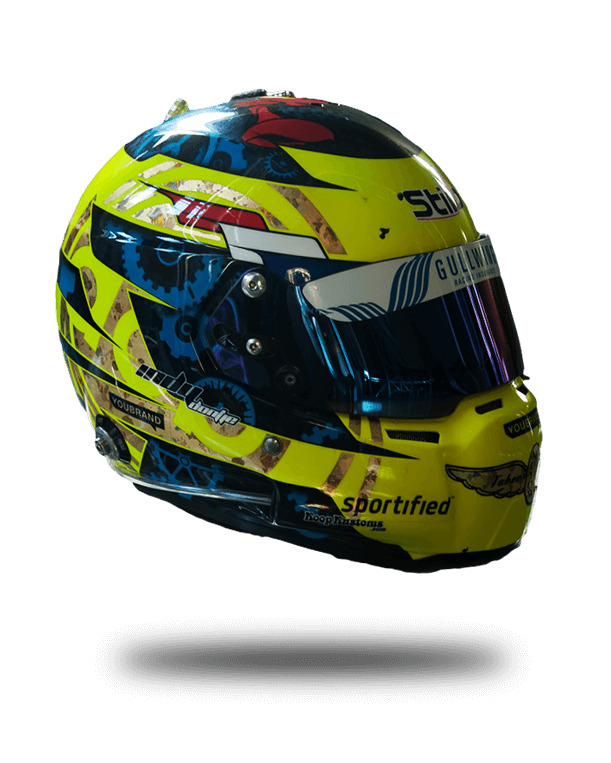 At the front, below the visor, you will find the logo of Indianapolis, as that is where my name originates from. Within the logo I have ‘Tabee Barry’, which means 'Goodbye Barry'. Barry was one of my best friends who got killed in a car accident. This way he is always with me on track. Indy’s state of the art driving centre in Lelystad. © 2019 Indy Dontje. by StOM.